Here at Home to Indy, we're not usually ones to push products. But we are so in love with Nest (and we're equally convinced that you will be too) that we wanted to share it with you. If you own a house, chances are you take precautions to protect your home with items like a smoke detector, carbon monoxide detector, and a security system. What if we told you that you could control all of those items with a few clicks on your phone (and you would save money and energy by doing so)? Hard to believe, right? Meet Nest. It's our new favorite technology for homes. Here's why. Most people forget to change their thermostat when they leave the house. 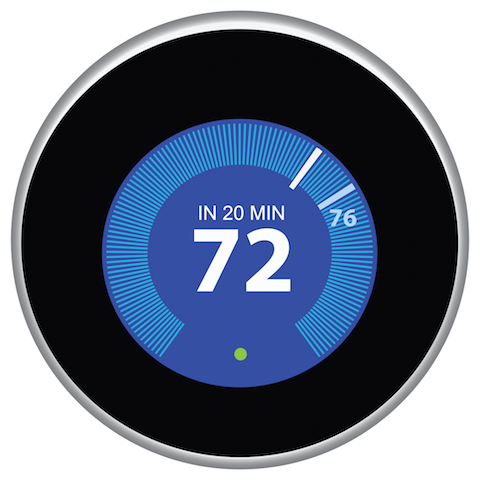 The Nest Learning Thermostat figures out your schedule and programs itself to be more energy efficient. All you have to do is turn it up or down with your preferred efficient temperatures for a few days. Within a week, it will start setting them on its own. (It's that easy!) With its Auto Away feature, it knows when you're home and when you're gone (and adjusts temperatures accordingly). Nest is accessible from your phone. The Nest App allows you to connect to your thermostat from your phone. So if you're heading home early and want to warm up the home, you can do so with a swipes on your mobile. You can also track your savings (of money and energy) with its monthly reports - also accessible from your phone. If you utilize Nest Protect (its smoke alarm and carbon monoxide detector), Nest will alert you on your phone if something has gone awry in your home. It also lets you know that your batteries might be getting low. Nest integrates with third-party products. If you're looking for ways to be more green, save money, have mobile control over your home-protection devices, and integrate with third-party products, then Nest is for you. Do you have Nest? If so, we'd love to know what you think of it! Let us know in the comments below!